Vern Burkhardt (VB): You stress, "Tolerating creating destruction is the only road to ongoing success because it allows you to continue on the journey, and the journey will always move through the cycle of Collaborate, Create, Compete, and Control." How does this work? Jeff DeGraff: It works the same way as economies, organizational development, maturation cycles of companies, and product cycles. Typically when something starts it starts in the forward position. It starts in the "Green Create" quadrant where somebody has a new idea, they've got something they want to explore personally, or they have a creative spark. Unfortunately a lot of creativity and innovation books stop there. There are a lot of bases you've got to touch to make all of this work. When you start in the forward position you're exploring. Then you move to the middling position – those Blue and Yellow positions – where you've got to figure out how do I fit this in, how do I achieve this goal, how do I make money, how do I get my weight down, how do I achieve a short or mid-term goal? At the same time you have to develop capability and values around it, which is in the Yellow position. At the end you have to assume the Red position and figure out how to systemize everything. My idea of creative destruction is exemplified by what happens in our lives. I can speak to my own career this way. When I was young I designed and built a lot of things, and I was also resistant to procedures, hierarchies, and existing ways of doing things. What happens is over time to most of us is we become more accomplished. We have become the incumbents. We're now the authority figure and our life becomes heavily optimized. We're now a Partner at the consulting practice, the Attending Physician, or a Tenured Professor. It's at this moment we are in peril. This is where Joseph Schumpeter's famous saying is appropriate, "The seeds of our undoing are sown at the pinnacle of our success." What Schumpeter was talking about is the same thing that economists mean by creative destruction. It's the same thing as the organizational life cycles Larry Greiner, the USC Professor, described in his famous 1972 paper titled 'Evolution and Revolution as Organizations Grow'. Based on a review of historical changes in large American organizations he described five growth stages that encompassed evolutionary phases with prolonged periods of growth, and at the end of each of these stages there was a crisis leading to a revolutionary phase. Whether you're reading Erik Erikson's Stages of Psychological Development or Abraham Maslow's Hierarchy of Needs this is the point where you have to remake your life. The problem is everything in your life at this point is about eliminating variation. However, this is the point where you have to let variation in. This is what in the old days we used to call 'the midlife crisis'. Today we have a lot of them, and it's not just with men. This is the point where you say, "Is that all there is? What will I leave? What is my legacy? Is this it? I didn't really want to be a doctor." In order to make this transition, there's going to have to be creative destruction. VB: "Most people pick too few targets, invest too much too soon, and lose it all because they never had the right 'target' to begin with." Is this a key observation for those who wish to be successful innovators? Jeff DeGraff: In the forward position you always hedge. You spread out risk. You spend less by going smaller and wider. Think about Steve Job. What a great story because of how many experiments he ran. These were bigger and more expensive than the experiments you and I would run. He didn't have $500 million in Pixar; he had $10 million in Pixar and that horse came in. Think about all the things he did in his 'out' period when he was in the 'hinterlands', such as NeXT. What's remarkable about Jobs isn't that he was a billionaire. It's how many different ways he made money. A perfect example for many of us is we say, "I'm going to lose weight on this diet. Well, maybe but why don't you try three diets in succession. "I'm going to meet the partner of my life by joining this club." Well, maybe but why don't you put less trust on the one way and instead join three clubs? And then there's the optimist who says, "My business is going to work first time out." No it's not. "This innovation is really going to hit." No, it's not. Am I being negative or pessimistic? No. I learned in my life to not bet horses to win. Bet stables to show. It's how you win in this innovation game. It's never the one you think is going to hit that hits. There are a lot of times where you get it wrong, but because you've hedged or diversified you've made provision that you're not going to be right in many but you may be right in a few. VB: You play the percentages. Jeff DeGraff: You play percentages. It's a good way of thinking about it. You play the percentage game. VB: "Innovation resembles the making of art because at its core, it's what we call ambiguous and emergent: You don't know what will succeed and you don't know when it will appear." Would you talk about this? Jeff DeGraff: Bob Quinn, whose office is next to mine at the Ross School of Business, is the famous change guy. He said, "Change is about building the bridge as you walk over it." This famous quote is applicable to innovation. The metaphor I like to use is it's like climbing a mountain range. You don't have a line of sight until you get to the precipice. You can't see the next thing. The mistake people make is they say, "The next thing is going to look like this," but that's a fool's holiday. You've got to make provision and play it in such a way that you're flexible when you get to the next precipice. Half the time it's not bad, it's good. Who knew we were going to get this lucky break? There's a river here. There's a plateau here. Who knew? VB: Often when you reach the top of a mountain you still won't be able to see beyond the tall mountain in front of you. Jeff DeGraff: But isn't that the gift of it? The gift of innovation and of being human is that we never become complete. Most self-help books have it backwards. My hero is Benjamin Franklin. The glory of Ben Franklin's life is that he was constantly pulled forward by the next mountain range. He wasn't perfect. He was a terrible father and a dreadful husband, but that's a choice he made. Whether you agree with it or not is a different issue. We have a kind of longing that someday we're going to be perfect or we're going to be 'there'. There is no 'there', and when you think this through you realize you've never been 'there' nor has anyone else. What pulls people like Franklin, your IdeaConnection's readers, you, or me forward is there's always the possibility of being closer to completion. VB: There is no 'there'; it is only a process of becoming. Jeff DeGraff: It's both the frustration and the glory of the human condition. Why be here if you're not going to grow? VB: When talking about after-action reviews you say, "If someone has a goal …and that person tells others about it and gets lots of positive feedback for his or her plans, that person actually becomes less likely to reach the goal." Would you talk about this counterintuitive observation? Jeff DeGraff: Innovation creates a lot of anomalies , and this is one of them. This relates to something called 'secondary gain' which really challenges some of the prevailing wisdom around goal setting. I have a morbidly obese friend who has said multiple times, "I'm going to lose weight," and those of us who love him have a tendency to respond with great adulation. We tell him "that's great" and he feels good about himself. However, losing weight is about going to the gym every day, pushing away from the dinner table early, and eating apples instead of chips. These things are hard to do. So the positive response should be given for behaviors that will lead to weight lose instead of simply the intention to do so. Though we believe we are being supportive, we are not rewarding the desired goal. The same is true for innovation. People do a lot of PowerPoint slides and interesting documents, and others say, "Isn't this great?" With innovation there's a lot of customer observation, design, bench work, lab work, market testing, and prototyping among many other things which have to go into the process. These are the things for which you want to be rewarding people. I love Edison's famous saying, "Opportunity is missed by most people because it is dressed in overalls and looks like work." VB: Someone once said we would be much more creative if we got rid of all PowerPoint presentations. Jeff DeGraff: Yes, and stop telling everybody what we're going to do as a substitute for doing it. If you've ever watched the program 'The Biggest Loser' it's an interesting study in human behavior. There's all the drama and then there's the weight scale. The scale is almost always inversely related to the drama. People cry and are sad because they really did want to lose weight but they focused on the interaction and not the task at hand. In order to innovate you have to first create the capability to innovate. That's part of my message. There is no big improvement for free. If you want to win 'American Idol' you've got to practice your sight reading, have natural talent, and put in your time singing all manner of music. Similarly, if you want to develop the next great application, you better know a thing or two about developing applications. VB: Nothing will replace 'blood, sweat, and tears'. Jeff DeGraff: Absolutely. I'm trying to point out in Innovation You that you don't have to be a super genius to reinvent your life, but you do have to put your shoulder to the wheel. VB: "Especially in America, I think there is a tendency to imagine that if one is true enough to oneself, committed enough, talented enough, self-improved and self-discovered and spiritually in touch, then the other levels [communal and universal] won't matter." Why do you think this is especially so in the U.S.? Jeff DeGraff: It's our foundational root. We're a Utopian culture. There are only about four ways in which somebody came to America. One was Gold Mountain; people came to California from the east and the west to make their fortune. They said, "I'm a special person and the country I'm in now is not allowing me to get rich. I want to be free and responsible." The second way was people were trying to escape the Czar, dictator, potentate, or other oppressor. Third people came here in chains which is an unfortunate bit of American History. Or fourth, like my family – my father – they were here until the Europeans came and said, "We're moving you along and taking your lands." The point is that, other than the last two, the majority of Americans came here with a doctrine of self-reliance and manifest destiny. Ralph Waldo Emerson, Walt Whitman, and Mark Twain had a real sense about this. I'd like to add another doctrine which is also useful in understanding America. It's the doctrine of pragmatism. Does it work? Can we make it work? How can we make it work? This is the doctrine described so well by John Dewey and William James. If you combine the concept of manifest destiny with the concept of pragmatism – it has to work – then manifest destiny makes sense. If it doesn't connect to reality it's a form of self-deception. VB: Given how successful the U.S. has been pragmatism must have played an important role. Jeff DeGraff: It certainly has. It ties into the concept of SODOTO – See One, Do One, Teach One – which is right out of John Dewey's work. You have to see something like a medical student who follows a medical doctor around when they're at Medical School. When they graduate and actually have to do surgery it's done under the careful watch of the Attending Physician. This goes on for a considerable number of years, and later they may become the Attending and have the Resident follow them around – Teach one. This is why we have great doctors, engineers, lawyers, and other professional services. VB: Would you tell us about Innovatrium, your innovation lab? Jeff DeGraff: I'm grateful that early in my career I turned down an Ivy League position in favor of working for an owner of a $20 million pizza company. Lucky for me the company was Domino's Pizza. I learned a lot about building businesses. Similarly, I learned a lot from my brief experience with Apple. This really helped me develop a perspective that few professors get to have. It gave me a real understanding of how companies innovate and grow. Because I'd seen and done a lot I learned the craft of innovation. This is one of the reasons I built the Innovatrium. It was meant to be to innovation what the Julliard is to music. The people I take into the Innovatrium as students are highly talented. The notion is this is where you start, not where you finish. You start with the kid who can play Bach and work from Mozart to Rachmaninoff's Third. You're trying to surround that person with people who are deep and diverse domain experts, and are more knowledgeable and experienced than they are. This is the same thing you do with corporate leaders and with educators. It's because all learning is developmental. If you don't believe this take out a piece of paper and draw a picture of your dog. With one glance at your drawing I could tell at what age you stopped learning to draw. Innovation plays directly into the development aspect of education. You have to learn to do it. One of the most brilliant things Steve Jobs ever did was create the role of the Apple Fellow – leaders who are highly practiced at moving an innovation through the system. There are lots of experts, but not a lot of people can move an innovation through the system. Similarly, 3M has the "Carlton Society." It's a great model. The Innovatrium was designed to do these three things. It was designed to use the See One, Do One, Teach One approach to develop highly practiced innovation facilitators who can move innovations through the system. The goal is to develop people to be like the Apple Fellows. It was also designed as a place to connect across boundaries. Remember innovation happens at the edges of the disciplines. There are only about four Carnegie One schools in the world ranked in the top 10 in all 95 areas. They are Harvard, Stanford, Michigan, and Berkeley, but if the State California continues to cut funding to their world class system they're not going to stay there very long. I teach in one of those places that needed a Switzerland, a place where the people from the Law School, Engineering School, and Medical School can sit and talk and there's no concern over who gets the journal credit, who is going to get tenure, or where the funding will come from. We drive a lot of business to the University for technology transfers and business engagements, so we're good at helping the University. We had to create a place outside of the big institution. It's no different than the incubators you see across the street from big technology or research centers. And finally, we needed a line of sight because half of innovation is about knowing what is currently going on. It's got a shelf life. It goes sour, like milk because it's time bound. The challenge is to keep abreast of what's going on? This is a true story. I was at one of our jump-starts about a year ago working with a big pharmaceutical on a drug discovery. We brought in a young man who was studying in the School of Medicine, and he started talking about two research papers. One was out of Switzerland and I think the other was out of the University of Washington. Basically he was telling us that everything we knew about diabetes was wrong, and there was a bit of incredulity about what he was telling our group. Two months later we realized he was right. Everything we knew about diabetes was wrong. The notion is if you don't have a line of sight to new discoveries and information, if you're not aware when this kind of knowledge comes to the forefront, if you're six months, nine months, or twelve months behind, you don't have a chance. Somebody will have already gone up the mountain. Somebody will already have their track shoes on and be heading up the mountain. VB: How do you have time for the work with Innovatrium? Jeff DeGraff: It's across the street. I tie everything I do together – my writing, teaching, and creativizing. Also, I've organized my life so the various aspects of what I do don't have dichotomies. And I invite the people who work with me to do the same. I've learned that in order to make it work I can't have it all at the same time. There has to be an order to having it all. Some days I'm a really good Dad and other days I'm gone. One has to have enough good days and on-the-spot days to make it work. It's always a balance. VB: You say that the U.S. is "losing its edge in creativity when we need it most." Are you optimistic this will be turned around in the coming decades? Jeff DeGraff: I'm partially optimistic. We face two enormous issues. I'm concerned about the lack of a sense of destiny among young people – our next generation. The responsibility for this lies with our generation, as we are the ones who raised them the way we have. As a baby boomer I grew up with the assumption that innovation and progress would solve everything. Although it's not completely true it did give us a sense of optimism. Lake Erie is dead but we can fix it, and we did. Greenhouse gasses are causing climate change. We can fix this, and we are working on it. When I visit companies I see that immigrants are bringing a sense of destiny to our shores as in the past. Hopefully the influx of people who are not native to this country will re-invigorate the rest of us with a stronger sense of destiny. We need the new drug, the new business model, and new ways of doing things. We need to work with our educators and our children to rekindle the fires of our imaginations. The second issue I'm concerned about is not having creative minds. Rather than developing the creative minds of our children we're cutting all the arts in schools which are where the fluency and flexibility of the mind is developed. Creative minds are needed when somebody needs to be able to put together a musical composition, paint something, create some unique and original thoughts, or critically analyze what they see and hear in the media. These cuts are alarming. My advice is if these cuts are going to continue in the education system parents will have to double their efforts at promoting creativity among their children while they're at home. They will have to take their kids to violin, trombone, guitar, or other music lessons if the schools won't provide it. Parents also have to encourage their children to find their own voice. I wrote an article about this for a popular parents magazine, and have never received so much feedback. There were thousands of emails. Mothers and fathers see that their kids have become passive because video games, the Internet, and television are their source of action. The fact kids themselves have to make it happen has been lost in the translation. VB: You have an interesting website for people who are concerned about these types of issues. Jeff DeGraff: Yes, my team created a web site together with Thompson Reuters which is quite extraordinary. It's extraordinary because every day there are 20 new articles, courtesy of Thompson Reuters, about how do you personally recreate yourself. It has topics on family, spirituality and faith, education, health, and finance – the areas where most people want to reinvent themselves. It's intended to be a gift to those who are concerned about improving themselves. The home page always has the most current article. Some interesting things have happened which I think you'll appreciate. Many websites have syndicated my website so our articles show up on their sites as well. The website includes an online self assessment for individuals which gives them a brief personal profile of their preferred approach to innovation among the four we previously discussed – collaborate, create, compete, and control. The site also provides a wealth of tools for people to begin to reinvent their lives. In essence, its big time corporate innovation practices translated for individuals. Think of it as business school meets self-help. The Innovation You program is currently airing around the US and there is an accompanying DVD workshop series that can be purchased on Amazon, Barnes and Nobel, or Target, as well as other retailers. There has also been an almost overwhelming interest from big companies to have their people learn how to innovate for themselves. They want their leaders to have a personal Renaissance and believe they will bring this work to spark corporate creativity. VB: The website has taken on a life of its own. Jeff DeGraff: It has, and I have to say it's about building the bridges you walk over – this was a surprise. VB: What triggered your idea to write Innovation You? Jeff DeGraff: In 2008 I was writing a sophisticated book for executives and it occurred to me that I needed to get a message out to individuals who are struggling. So I stopped writing that book and started a new one. The target was the people who are in the middle, those who come from the same kind of working class neighborhoods as me. I made the PBS program for the same reason. In addition to helping to raise pledge money I wanted to talk to people about how to visualize their life as a portfolio of innovation 'investments', be able to move around the cycle of innovation, and engage in innovation for life. I built the website for the same reasons – to give to people the necessary tools. VB: Are you working on your next book? Jeff DeGraff: I am, but I'm still processing what is going to go into it. I'm thinking a lot about grass roots movements to recreate America, as well as big upheavals in other parts of the world, and how their ideas about Utopia can actually provide some insights as to how to collectively innovate. Early on I was interested in the collaborative innovation game. I think my next book is going to be about how this actually works when you actually get beyond the hyperbole of it. Obviously the protestors in the park near Wall Street know they're not going to change politics and the economy, and they might not even change the direction of the spirit of the age. They know it and we know it, but there's something interesting about the great catharsis that's happening. With a little help it might turn into something productive, useful, and good. VB: Is there anything else you would like to tell us about how to become new and improved as innovators? Jeff DeGraff: The final thing I'd like to say is the biggest thing about any of this is getting momentum. Find something to start. It doesn't even matter what it is. People ask, "Well what happens if my goal changes along the way?" My advice is if it does this would be the best of all possible worlds. You just need to get moving and keep growing. Jeff DeGraff reminds us that the cavalry isn't coming to bail us out if we are feeling stagnant or stuck. We have to picture what we want, find a person who can offer suggestions, and then try one of these suggestions or our own ideas. As he says, your approach is everything. "How you innovate is what you innovate." "How you work on your life determines what changes you can get." Sage advice. Jeff DeGraff holds a Ph.D. from the University of Wisconsin-Madison. He is the Clinical Professor of Management and Organizations at the Ross School of Business at the University of Michigan. He teaches MBA and Executive Education courses on leading creativity, innovation and change. Dr. DeGraff's research and writing focuses on innovation strategy, change and innovation competency development, creativity and innovation practices and methods, creativity communities and innovation networks, and leadership development. He has consulted with hundreds of the world's most prominent firms such as GE, Pfizer and Coca-Cola to name just a few, and has developed a broad array of widely used change and innovation methodologies and tools. He is the Managing Partner of Competing Values, a consulting practice that specializes in helping organizations make change and innovation happen. He runs a leading innovation center, Innovatrium, with facilities in Ann Arbor and Atlanta, and serves as an advisor to think tanks and governments. He has worked all over the world, with significant experience in Europe and Asia, and in most industry and market segments. Jeff DeGraff was the Vice President of Innovation of New Ventures, a member of the executive team, at Domino's Pizza when it was one of the fastest growing businesses in the world in the 1980's. 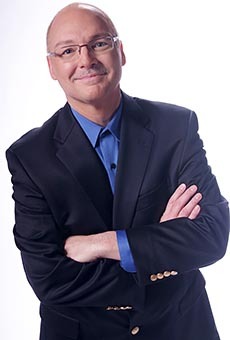 Jeff DeGraff is author of Innovation You: Four Steps to Becoming New and Improved (2011), and co-author of Creativity at Work: Developing the Right Practices to Make Innovation Happen (2002), Leading Innovation: How to Jumpstart Your Company's Growth Engine (2006) and Competing Values Leadership: Creating Value in Organizations (2007). His PBS Special called "Innovation You" introduces viewers to his ideas contained in the book of the same name.